Microsoft Outlook has some nice productivity features for email addresses called AutoComplete and AutoResolve. Each offers conveniences, but there are differences between the two. And if you’re not careful, one of these can cause problems. Don’t worry, we offer a fix. As you might guess, Outlook’s autocomplete and autoresolve features help you with email addresses. The main difference between the two is where they look for the information. AutoResolve uses your Contacts folder but AutoComplete suggests entries from a hidden system file with a .NK2 extension that is linked to a specific Outlook profile. The autocomplete feature is available by default on the Advanced E-mail Options dialog. This feature saves to a file any typed email addresses even if the person is not in your Contacts folder. In addition, it will add addresses you assign using the To, Cc, or Bcc buttons. On the other hand, if I created a contact record and added this email address, the address wouldn’t be part of this file until I send an email. The feature displays a drop-down list of suggestions based on what you type when addressing any email address fields. This .NK2 file is sometimes called the nickname list or nickname cache. Don’t confuse this with the Nickname field on the Detail tab of a contact record. For example, if you create an email and typed abuse@hootmail.com, that email address is added to Outlook’s nickname cache file. This special file holds up to 1000 email addresses along with the person’s name, email type, and some other info. 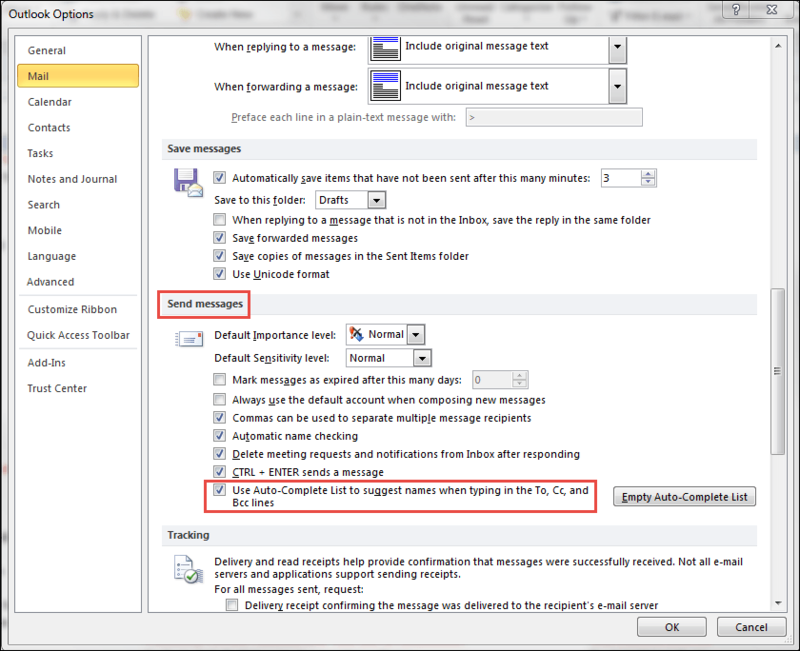 The addresses you type during your session are added to your NK2 file when you close Outlook. If you have multiple Outlook Profiles, you will have a .NK2 file for each one. 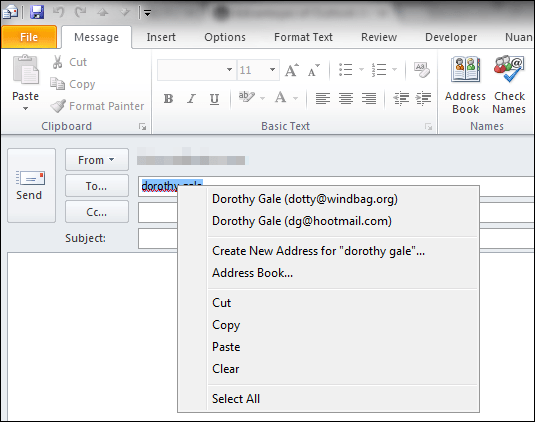 The next time you start to type an email address in the To, Cc or Bcc lines, Outlook suggests matching entries. In the example below, as I’ve typed each letter, Outlook filters my suggestion list. I can hit Tab or Enter to accept the highlighted entry or use my arrow keys to change the selection. One problem with Outlook’s autocompletion feature is it accepts what you type. There is no confirmation dialog where you can check your entry. In the example above, I misspelled Hotmail. If I’m not careful and accept the suggestion, I will be sending an email to the wrong person. This is a frequent problem for people who don’t create contacts but prefer to use this file in their pseudo address book. Open an Untitled Message Window in Outlook. Type the first few letters so the bad entry appears on the list. Highlight the item you wish to remove from the autosuggest list. You may need to use your directional keys to move up and down the list. Retype the correct entry in the address line and send the email. When you close Outlook, your bad entry will be removed and your corrected entry will be added. Some people find the suggestions annoying. Others don’t like the concept for privacy reasons. Another way of thinking about this file is as the last 1000 email addresses you sent correspondence to including CC and BCC addresses. If at work you sent your resume to hotjobs@coolcompany.com and deleted the email, there is still a trace in the .NK2 file. The good news is the file doesn’t explicitly state whether the address was a BCC address or not. If these items are of concern, you can turn this suggestion feature off. From the File tab, select Options. On the Outlook Options dialog, click Mail. Although some people are fearful of these files, they do offer benefits. If Outlook becomes corrupted, you may be able to recreate contact records by using the NK2 file as a source file. It won’t have all the contact details, but it’s a start. Or, if you’ve never created contacts and instead used AutoComplete to track your email addresses, the file is a good basis to build your Contacts. The file can also be copied to another computer. One nice utility is from NirSoft because it also finds the Nk2 file location automatically. This can be an issue as the location and name change based on your Microsoft Outlook version and your operating system. The site also lists those file locations too. AutoResolve is another convenience offered in Outlook but without concerns for hidden files. This feature checks the names you type on an outbound email to see if they match those in your Contact folder or designated address book. The intent is to prevent you from sending emails to people without email addresses or contacts with multiple email addresses. In the example below, I typed the contact’s name, Dorothy Gale, rather than clicking the Send New Message to Contact icon on her record or using the To button. When I right-click the red underline, Outlook will try to resolve the name Dorothy Gale with the email addresses in my Contacts folder. In this example, Outlook is informing me that Dorothy has 2 different email addresses. Like AutoComplete, this feature is enabled from the same Outlook Options dialog. The option is called Automatic Name Checking. The feature is useful as it allows you to type names, not email addresses. However, sometimes the color coding under the names doesn’t show. In the example above, Dorothy’s name should display a red wavy underline since she has multiple emails and I’ve not sent her an email before. This would be my clue to right-click her name and choose one of the email addresses that appear in the box. This color coding provided faster feedback but stopped working after I upgraded to Outlook 2003. Since I’m more inclined to type the email addresses, I haven’t spent the time to troubleshoot the problem. As you can see, both AutoResolve and AutoComplete allow you to enter names or emails faster. You may find that one or both features serve your needs. The trick is knowing where the data comes from and how to act.